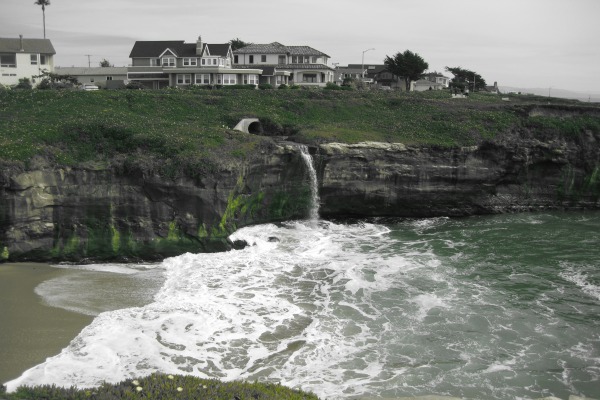 Most people don’t know about Santa Cruz, except that it’s about an hourish outside of San Francisco. Santa Cruz is this hidden gem on the coast of Northern California and features a winning combination of Redwood Forest and beach, with lots of farms and vineyards around it. Walking around the campus, you walk through giant Redwood trees alongside deer, raccoons, squirrels, and banana slugs. Yes, my life is Bambi. Downtown, we have a boardwalk with amusement park rides, where you can find your deep fried twinkies and deep fried oreos. Weird that Paula Deen hasn’t visited us yet. Coming from Southern California. all I heard about Santa Cruz was how hippie it was and that the mascot at the University was a banana slug (real threatening, watch out). I’m not going to lie, Santa Cruz is pretty hippie, and I have embraced my inner tree hugger here, but it’s an extremely diverse city. We have a range of people, from barefoot kids with dreads to your typical frat guy; vegans, vegetarians, gluten-freers; there is a place for every type of person in Santa Cruz. Because what comes with diversity and hippiness? HELLA* GOOD FOOD. We have lots of local small businesses, breweries, many a grocery store, and absolutely killer restaurants. Living the slug life yo. *Hella: a “norcal” term. Fun word for you to impress your friends with. Great quality, great ingredients. And talk about burger selection. Burger has an insane amount of burgers, all with hilarious names to describe them. Order the “Luther,” which is a cheeseburger between donuts. Or the “Fatty” which is a burger between two grilled cheeses. All of their burgers are grassfed and they use many local ingredients. Fries come with each burger and I usually upgrade for the 50/50, which is sweet potatoes and regular fries. They even have poutine, which has definitely tempted my Canadian uncle. And just when I thought their burger selection was huge, I then saw the beer menu, which has a GINORMOUS amount of beers. Or you can order the beer milkshake. Yep, you heard me right. Order it, it’s fantastic. And after you’ve placed your order, you get to take back a lovely celebrity mug shot instead of a generic number. Last time Nick Nolte and I had a staring contest until I got my burger. The first time I went to Saturn’s, I wasn’t even aware of the fact that it has an entirely vegetarian menu. I was happily munching on my Santa Fe salad, thinking “my, I want to swim in this cilantro dressing and oh, how it compliments the chicken so well” when my vegetarian companion gleefully broke the news to me. I seriously did not even notice the difference! Saturn’s has such a great and wide selection of items, from veggie burgers to taquitos, to mac and cheese. And their milkshakes are absolutely delish. I won’t turn down a milkshake in an oldschool glass. Modeled to look like a new space-age diner, the vibe is fun and different and great to go with family or as a big group. Must Order: Santa Fe Chicken Salad, any milkshake, fries. The Del Mar Movie Theater has that classic, old school movie theater feel that will transport you back in time. They show indie, artsy, foreign, and new movies, but the real reason I go to this movie theater is for their midnight showings. They always offer great, cult classic movies, such as the Rocky Horror Picture Show or Star Wars, which draws a huge crowd of fans, making the atmosphere of the movie even better. I often screw up the name Planet Fresh and refer to it as “Planet Burrito,” indicating how my subconscious truly feels. Planet Fresh is truly the Mecca of all things burrito. The options are endless: choose among Thai burritos, seafood burritos, Greek burritos, and of course, the classic burrito, among others. You get to choose which type of rice, tortilla, and bean you would like. And you can choose to get it “wet style,” which means they’ll put their homemade enchilada sauce on top. People, this sauce is crazy good. I basically order enchilada sauce with a side of burrito. They also have a large salsa bar, with lots of options to choose from. I always go for the pico de gallo because I’m a wimp with heat. Must Order: Any burrito, wet style. Santa Cruz is all about local and organic and the Penny Ice Creamery, lovingly referred to as “Penny,” is no different. They take seasonal fruits and vegetables, coupled with only organic dairy, eggs, and sugar to make mind-blowing combinations. Parsnip-nutmeg? Oh, yes, they went there. They always have interesting and creative flavors. The flavors constantly change, as they reflect the season, which is great because then you get to try a range of flavors rather than getting the same thing every time. They also have an open kitchen, which is very fun to peek into and see what they are creating. It’s late at night and who are you going to call? No, not Ghostbusters. Nite Owl Cookies is hands down one of the best phone calls you can make. Why? They deliver freshly baked, piping hot, gooey cookies right to your door! Even better? They also deliver a half gallon of milk (or other choice beverage) along with your yummy cookies. Or you can get an ice cream sandwich if you’re feeling the creamy, crunchy combo. These cookies are massive, which is even better. The only downside is that you can only order at night, otherwise you’d better believe that I would be ordering fresh cookies in class and getting them delivered to me on the reg. You can also order online. Verve is another Santa Cruz gem that believes in quality product. They roast their own coffees and even travel to meet with farmers and producers to find the best coffee bean. Each cup has had a lot of thought and love put into it. The people are always very friendly and they have lots of coffee/tea knowledge, so they can help you pick the best cup for you. Plus they do adorable coffee art in each cup, how’s a girl supposed to resist that?? If you aren’t a coffee fan, they also have a huge selection of teas. I personally love the White Coconut Cream, which is creamy and sweet. They also have black, green, and white iced teas, which is rare for an avid iced tea drinker to find. They have three locations, each with a different unique, and comfortable vibe. Personally, I like to bring my bag o’ stuff and nest there for a few hours with a hot cup of tea. Must Order: Chai, any of the coffee in their French Presses, Velvet (hot tea) and ESPECIALLY a cookie. Empire Grade has been and continues to be one of my favorite places to run, taking you through Redwood trees and beautiful scenery. There are so many paths; I always find a new path to take, which makes it an ideal place to go for hikes. There is enough room for runners, mountain bikers, hikers, and walkers. You feel so connected to the Earth (getting hippie Santa Cruz on you) because it’s so quiet and peaceful up there. The Crepe Place is a fun, romantic venue for a date or a group of girlfriends, and on most nights there is live music. They have a front bar, inside seating, and (my personal favorite) the back outside seating. The back is so elegant, with wire, patio furniture, twinkle lights, water fountains, and lots of greenery. The crepes are not what you imagine, they are HUGE. I’m always boggled by the amount of things they are able to fit in there and the assortment of ingredients you can choose from. The crepes are stuffed full of deliciousness and they of course have great dessert crepes. This is another Santa Cruz classic, which serves up California-style Asian street food. The owners are big believers in local and organic ingredients as well and they have a loyal vegetarian and vegan following. With many vegetarian, vegan, and gluten-free options, they even make sure to use separate utensils for the vegetarian/vegan items, which can be rare to find. Their menu covers many Asian cuisines, with more Thai and Vietnamese options. It’s fresh, fast, yummy, and easy to substitute or remove ingredients. It’s right near the Rio Theater, which makes it the perfect destination before a concert or show. I mean with that kind of name, you’ve gotta deliver, right? The selection of beers is kind of insane. If you feel overwhelmed by the amount of beers, go for the taster tray of four small 4 oz. drinks to get a feel for the variety of beers they offer. Or you can just chat with a bartender or waitress, as they are incredibly helpful and patient while you try to figure out what your thirsty for while simultaneously humming the song in the back of your mind. Must Order: Anderson Valley Boont Amber, local beers, and the IPAs! Ok first of all, cute name right? I’m such a sucker for catchy restaurant names. But thankfully, Pizza My Heart delivered big time. They have several locations, one of which is in downtown Santa Cruz, which is perfect when you just want to grab a slice and stroll around. Try the Big Sur, which is covered in 40 cloves of roasted garlic, pepperoni, sausage, Portobello mushrooms and green onions. This might not be the best choice for a date, but it’s so freaking good. They also have a lot of vegetarian choices and veggies to choose from which is a big plus in my book. Must Order: Fort Point, which has tomato and pesto sauce and is covered in chicken, ricotta, sausage, and artichoke. Santa Cruz is an amazing place because it combines the best of both worlds. 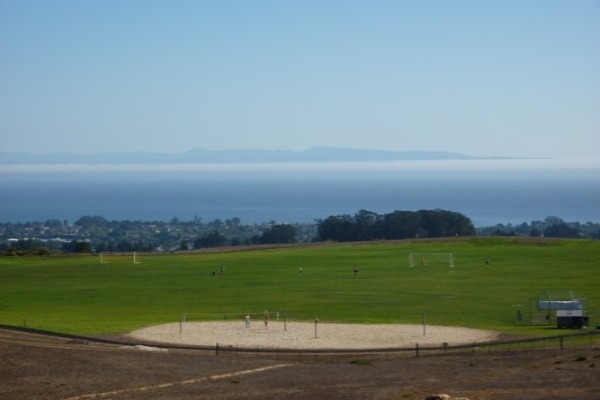 There is the forest filled with Redwood trees and the beautiful coastline of beaches along Monterey Bay. This winning combination equals magnificent walks around Santa Cruz. The best place to walk, bike, sit and stare at the ocean, drink a coffee or scope out cute surfers (sup cuties) is along West Cliff. This long stretch of coastline is breathtaking. There are huge bluffs, which are covered in blossoming succulents, little waterfalls, and long-standing trees. Grab your dog or iPod and take a walk along West Cliff, I guarantee it will put you at peace with the world. I Love Sushi is a blast. It’s not your average quiet and small sushi place, it has several rooms, lots of big parties usually going on, and a karaoke machine in the back. Oh, and the owner regularly challenges people to chug sake bombs. I think he takes like three gulps, it’s ridic. The ambience is well worth it, it’s a great place to go as a group. Plus they bring you free little sampler plates in the beginning. And when you are a cheap college student like me, you go bananas for “free.” If you go on your birthday, you’ll also get a free roll with a birthday candle…birthday sushicake anyone? Red room is what you imagine when you think of a bordello-esque, dark, and intimate lounge. Downstairs is the bar and on the second floor is the lounge, filled with red couches Thursday through Saturday the Red Room is hoppin’, so if you plan to eat there, make reservations for a bigger group. You can expect live music, but the type of music changes. It’s definitely a college-y crowd, which is probably because drinks are reasonably priced. Must Order: Truffle fries, this is a demand, not an order. Chicken and waffles. This funky woman-owned place is somewhat hidden, so you have to know where it is ahead of time—I drove past it several times before realizing where it was. But once you find it, you’re in for a treat. They have a wide variety of açai bowls (one even has peanut butter! ), fruit smoothies, and fruit bowls. It’s pretty filling, so just be careful. Friends usually take home the leftovers, but I pretty much scarf the whole thing down because it’s too yummy to practice self-control. The inside is adorable and cozy, with Brazilian music playing in the background. It’s the perfect place to bike to, especially because they have bike parking inside! Must Order: Amazon Bowl (açai, granola, banana, avocado), or any açai bowl, you really can’t go wrong. Before I moved to Santa Cruz, everyone told me that I had to try Marianne’s for ice cream. Ice Cream is probably my favorite dessert of all time, so I knew I had to check this place out. And ever since I moved from the East Coast, I have NEVER been able to find a good Black Raspberry (blackberry for us West Coasters) until I went to Marianne’s where I quickly died and went to heaven. Think creamy and sweet goodness melting in your mouth. It’s a tiny red ice cream parlor and a Santa Cruz landmark where you go in and take a number (it gets packed). They have so many flavors, the whole back wall is covered in flavor options; you can definitely find something for everyone. Just remember to bring cash because they don’t take cards! I purposely invite my parents to visit me just so I can go eat at La Posta. My family randomly stumbled upon this place my freshman year and since eating there, we have made it a tradition to go back. La Posta is all about the local and farm fresh ingredients—they even have chickens in the back parking lot! Dedication. Their menu changes seasonally, but is always fresh and absolutely scrumptious. Everything is housemade, even the sausages. The menu is on the pricier side, so my family usually gets a bunch of apps and a few entrées and splits it all. They also always offer pizza, which makes you feel like you’re taking a bite out of Italy. But you must, MUST save room for dessert. So worth it. They make their own ice cream, which I order every single time. This is your classic family owned Italian deli, with killer sandwiches. They offer your classic deli sandwiches, like the Reuben or the Muffaletta, but they also offer some unique sandwiches like the Turkey Cranberry (Thanksgiving can come more than once a year! ), Hawaiian Chicken, or the Meatloaf sandwich. There are a bunch of chips, sides, and drinks to choose from. Or you can create your own! Sometimes there is a wait, but it’s well worth it when you’re craving sandwich perfection. If you’ve driven around Northern California, then I bet you have seen the “mystery spot” bumper stickers on the back of people’s cars. This is a Santa Cruz landmark and it is always fun to bring your parents or visitors. I’m tempted to not tell you what occurs at the mystery spot to keep the mystery… I’ll just say that gravity and physics don’t apply here. You may have heard about my love of the macaron. And fortunately for me, macarons exist in Santa Cruz! And they have great flavors that I never saw in Paris, like the ollalieberry. Kelly’s has lots of french goodies, like croque monsieurs, eclairs, and all things tart. Kelly’s also makes a bunch of different breads, cakes, and has a whole café lunch menu. It gets pretty jam packed, especially on the weekends, so plan ahead. And Kelly’s is dog friendly, so be nice and treat Spot to a macaron. Must Order: Any of the macarons, the morning bun, the tiramisu, the gruyere and apple sandwich. Like I mentioned before, college students have a limited budget. Luckily, there is Woodstock’s, which has a pint night every Wednesday- $5 for the first glass (which you get to keep) and $1 for every other subsequent beer. Just know that cheap beer equals lots of people. But Woodstock’s has a heated outside patio, which I like to sit at for some prime people watching. Woodstock’s has lots of different deals and they also deliver. They also have a trivia night every Thursday, which is extremely fun. But the best part is that they have gluten-free pizza (and it tastes good)! Or you can choose between a white or wheat crust. Kelsey Krasnigor is a proud banana slug at UC Santa Cruz who enjoys having people visit her so that she can eat at all of her favorite places on their dime (thanks parents!). Well that leaves me wanting to get back to Santa Cruz ! Thanks Kelsey now I’m HUNGRY !! Santa Cruz is so much fun! I LOVE the açai bowls at Café Brasil. For anyone visiting Santa Cruz, you MUST get one of them. Marianne’s Ice Cream is also a great recommendation (especially after spending a hot, sunny day at the boardwalk!). Best deep-fried item at the boardwalk? Pepper Jack Cheese on a Stick from Hot Dog on a Stick (a must-try for anyone visiting the SoCal beaches), which goes down great with a Slush Puppie. Great recommendation, Kelsey! Brynn, glad that you have experienced the amazingness that is Café Brasil. Açai bowls are the business. And thanks for the suggestion for the boardwalk, I had never tried that one, so thank you!! I’ve never been to Santa Cruz, but now I can’t wait to visit. You’ve just given me 23 reasons to start planning my trip! Wow! You’ve left me salivating… Expedia here I come!